The Indianapolis Indians finished eight games above .500 with a 76-68 record in the International League's West Division but were four games out of the Wild Card race, while the Altoona Curve finished last in the six-team Eastern League West. The Bradenton Marauders' strong showing after the All-Star break saw them clinch the FSL North Division second-half crown, and the West Virginia Power won its final five games of the year to end with an even .500 record in the South Atlantic League's Northern Division. In the New York-Penn League, the State College Spikes went 31-44 in the difficult Pinckney Division. Catcher -- Ramon Cabrera, Bradenton (92 games): A Florida State League midseason All-Star, Cabrera put together a solid season with Bradenton. The 22-year-old switch-hitter batted an organizational-best .343 with 53 RBIs in 92 games -- all career highs -- in the heart of the Marauders order, including a blistering .380 against right-handers. No other full-time backstop in the system had more RBIs, hits (112), doubles (25) or runs scored (46) than Cabrera, who will enter his fifth year of pro ball in 2012. Bradenton Marauders hitting coach Ryan Long said: "Cabby is an offensive-type catcher, but he understands the value of being a catcher first. ... He is a natural hitter from both sides of the plate, and he uses his instincts well. ... He seemed to be a much older hitter than he actually was." Larry Broadway the Pirates' director of Minor League operations, added, "Cabrera really jumped forward after his first full season in 2010 and had an excellent offensive season. More walks than strikeouts for any everyday player is an impressive feat." First base -- Matt Hague, Indianapolis (141 games): Hague hit .309 with 12 homers and 75 RBIs in 141 games with the Triple-A Indians in 2011. The 26-year-old also smacked a career-high 37 doubles and scored 70 runs. The former ninth-round Draft pick, named to the IL's mid- and postseason All-Star teams, had a batting average that ranked sixth among all Pirates Minor Leaguers, while his 75 RBIs ranked third. Said Broadway: "Matt had a terrific season anchoring our Triple-A lineup in a ballpark that does not favor right-handed hitters. He has shown he can hit at every level he has played at, and 2011 was no exception. His consistency has earned him a spot on the 40-man roster coming into the 2012 season." Second base -- Jarek Cunningham, Bradenton (80 games), GCL Pirates (two games): Cunningham missed the last 48 games of the season after experiencing concussion-like symptoms, but the numbers he put up in the first three months showed the growth he had made since sitting out the entire 2009 campaign with an ACL injury. The 21-year-old smacked 15 homers and plated 51 runs in 310 at-bats. Cunningham made two late-season appearances with the Pirates' Gulf Coast League team before deciding he was healthy enough to play in the Arizona Fall League for the Mesa Solar Sox. It's expected that the Spokane, Wash., native will begin 2012 back in the Florida State League. "Talking with him after the AFL, is seems like he matured a lot," Long said. "He learned how to handle his at-bats, and I think he has the capability of being a solid big league hitter. I think he could compete at Double-A [in 2012]." "Jarek made improvements offensively this year that carried him into an invitation in the Arizona Fall League," Broadway said. "Jarek has missed some time due to injuries in his brief career, but he has maximized his development time when healthy." Third base -- Elevys Gonzalez, Bradenton (126 games): Gonzalez hit .322 and plated 83 runs -- the most in the organization -- this year in what many people consider to be his breakout season. If it wasn't for a slight midseason slump, his numbers would have been even more impressive. He hit .379 in April, .400 in August and .396 with runners in scoring position. No other Pirates third baseman recorded more RBIs, scored more runs or hit for a higher average than Gonzalez. "He got to know himself, and that was big for him," Long said. "He is a guy that now knows what he wants to do at the plate, and he learned that if he has a hiccup to regroup. That is a sign of him maturing. Broadway added, "Elevys played a full season at [Class A Advanced] Bradenton this year and led his team in RBIs and was second in batting average behind Ramon Cabrera. He played at a young age for his level and was not intimidated by the competition." Shortstop -- Jordy Mercer, Altoona (72 games), Indianapolis (60 games): In his fourth year of pro ball, the Oklahoma State product graduated from the Eastern League to the International League. He hit .268 with 13 homers and 48 RBIs in Altoona before adding six more longballs and 21 RBI in 60 games with Indianapolis. Mercer led all shortstops in the organization in runs and RBIs, and his 19 total homers ranking first in the entire system, four more than any other Pirates prospect. "Jordy split his season between Double-A and Triple-A where he really anchored down the middle of the infield. His continued improvement up the middle defensively has earned him a spot on the 40-man roster coming into the spring," Broadway said. 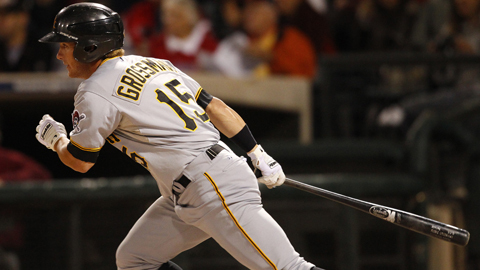 Robbie Grossman, Bradenton (134 games): Grossman repeated the Florida State League in 2011, putting up historic numbers. He hit .294 with 13 homers and 56 RBIs out of the leadoff spot, but his real value came in the form of 100 walks and 100 runs scored. He became the first player to accomplish this feat since Nick Swisher last did it with the Sacramento River Cats back in 2004. The switch hitter also stole 24 bases, making him the prototypical No. 1 batter in the lineup. A postseason All-Star with the Marauders, Grossman went to the Arizona Fall League in the offseason where he was named to the Rising Stars game and All-Prospect team. "I still have a lot of work to do, but I'm excited for what's to come," said Grossman in a Q&A with MiLB.com last month. "A couple years of pro ball got me more at-bats left-handed against right-handed pitching, and it really paid off. It's definitely taken me some time, as you can see, but I'm happy with how it's come." Added Grossman's hitting coach Long: "We look to see guys improve in their second time through the league. Robbie didn't get wrapped up with being in the league again. ... It sometimes takes time for a high school kid to get a professional approach. He cut down on the strikeouts, cleaned up his swing from the left side and gained confidence." Starling Marte, Altoona (129 games): Marte combined contact hitting, power and speed en route to a successful year with Altoona. He was a mid- and postseason All-Star and the Eastern League's Rookie of the Year. In addition, he was named to the Futures Game as a World team member. Marte hit .332 with 12 homers and 24 stolen bases in 129 appearances. He also collected 38 doubles and eight triples, scoring 91 runs and driving home 50. Broadway said, "An exciting player to watch, Starling has very good athleticism and speed to go along with the ability to hit. The scary thing is that he is starting to mature physically and is starting to develop power as well. His speed-power-hit combo is going to make him a very fun player to see mature." John Bowker, Indianapolis (106 games), Pittsburgh (19 games), Philadelphia (12 Games): John Bowker has been around the pro game since being a third-round pick in 2004, appearing in the Majors in each of his last four seasons. The outfielder made 31 Major League appearances in 2011 -- 19 with the Pirates at the start of the year and then 12 more in September following a trade to the Phillies. Bowker spent three-quarters of the year tearing up the International League with Indianapolis, raising his value enough during the first half of the season for Philadelphia to take a chance on him. "John was a solid bat for us in Triple-A last year, driving in a lot of runs before we traded him to Philadelphia, where he got an opportunity in the Major league with them," Broadway said. "He has hit wherever he has gone, and he anchored a young Triple-A lineup for us in Indy while he was there." Utility -- Wes Freeman, State College (50 games), West Virginia (five games): Freeman hit a combined .299 across two levels in 2011, including .304 with six homers and 25 RBIs in 50 games in the New York-Penn League. His average would have ranked fourth in the league if he had enough at-bats to qualify. Now in his fourth year of pro ball, Freeman appeared much improved from a year ago, cutting down on his strikeout totals and flashing gap-to-gap power. He was named to the NYPL's midseason All-Star team. "Wes was one of our most improved players this year," Broadway said. "He made some mechanical adjustments that freed him up and allowed him to have early success, which built up confidence, and he never looked back." Right-handed starting pitcher -- Kyle McPherson, Altoona (16 games), Bradenton (12 games): McPherson combined pinpoint control with overpowering stuff in 2011. He went 12-6 between the Florida State League and Eastern League, striking out an organization-best 142 batters over 161 innings while walking just 27 batters. In 28 starts across both levels, the Mobile product posted a 2.96 ERA in 28 starts. His ERA ranked third in the system, while his 12 wins were topped only by Phil Irwin's 13. McPherson's top performance was the first complete game of his five-year career, a nine-inning one-hitter in Bradenton's 4-1 win over Brevard County on May 31. Broadway said: "Kyle has three quality pitches that he can command in the zone and get some strikeouts with. We increased his workload this year and promoted him to Double-A where he continued to attack the zone with nearly a four-to-one strikeout-to-walk ratio. He has put himself squarely in our mix of young starting pitchers at the upper levels." Left-handed starting pitcher -- Nathan Baker, Bradenton (29 games): Baker moved into the Florida State League full time in 2011, and it's likely he will see time in the Eastern League in 2012. He was 10-8 with a 3.34 ERA in 29 appearances -- including 25 starts -- and he fanned 105 batters over 148 1/3 innings. Opponents hit .258 against the 6-foot-3, 190-pound hurler -- exactly the same as a year ago -- but whereas he surrendered six homers over 44 2/3 innings in 2010, he only allowed six long balls in more than three times as many at-bats this time around. Broadway said: "Nate had a solid season for Bradenton, especially in the second half after working through some things early. The breaking ball is a work in progress, but he is aggressive with a low 90s fastball that touches mid-90s and has a good changeup to compliment from the left side, which is a recipe for success at any level." Relief pitcher -- Tim Wood, Indianapolis (40 games), Round Rock (four games), Pittsburgh (13 games): Selected back in the 44th round of the 2002 Draft, 29-year-old Wood had a solid season in the Minors in his first year as a closer; his 23 saves ranked second in the Pirates system behind Noah Krol's 24. He was 13-for-14 in save opportunities with a 2.96 ERA in 23 games for Indianapolis before being called up to the Pirates on June 10. Though his Major League 5.63 ERA and 0-3 record look rather unsightly, he did not allow a run in 10 of his 13 appearances. After returning to the IL in early July, Wood went 2-0 with 10 saves in 17 chances before being traded to the Rangers, who outrighted him after the season. The Pirates have re-signed him as a Minor League free agent. "He has power stuff, he attacked hitters and induced a high percentage of ground balls contributing to his success in Indy and ultimately earning him a promotion to Pittsburgh during the season," said Broadway.